Annadurai is now 29 Years old.His main goal is to get his customers feel happy and he needs customer satisfaction . 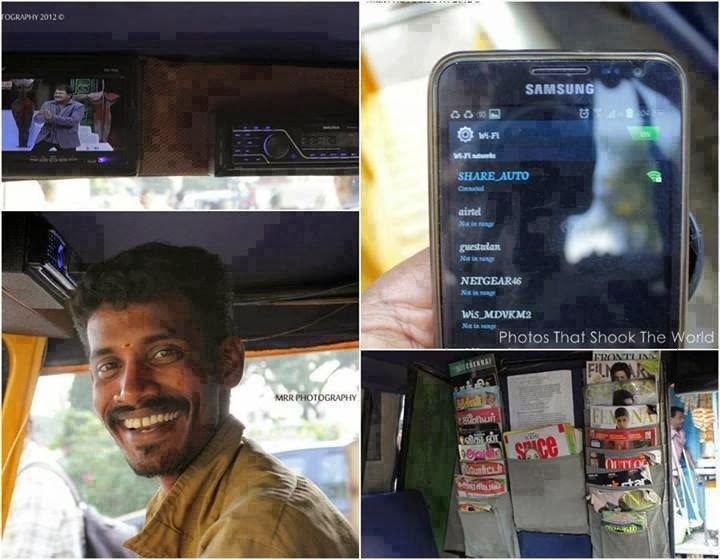 The vehicle is WI-Fi enabled and, if you're not carrying a laptop or smartphone to connect to the internet, Annadurai will slip you a 10-inch tablet. He carries an internet dongle attached to a WI-Fi router and offers free access to the internet. "Most people who take my auto work for IT companies and I know access to the internet is important for them," Annadurai says. "It takes about half an hour to cover the distance between Thiruvanmiyur and Sholinganallur.Why waste that time?" Says Annadurai. The auto also has lots for magazines and newspapers that contain the latest editions. Annadurai spends 4,000 Rupees a month on subscriptions to 35 various news publications. There are dailies for the customers who need to keep up on the news, weekly magazines for passengers who are taking a long ride, and glossy fortnight-lies for those interested in lighter reading. Annadurai spends more than 5,000 to give his customers an auto ride like no other in the city, yet makes a good living, taking home a profit of around 1,000 a day. "That is more than enough for a bachelor like me," he says. "I drive from 8am to 1pm and from 5pm to 11pm," he says. He charges Rupees 15 for the 11km route he covers, while other share auto drivers demand 20 for the same distance. "Money really isn't too important to me," he says. "What gives me pleasure is that people remember me and are grateful for the service I offer," Annadurai Says.